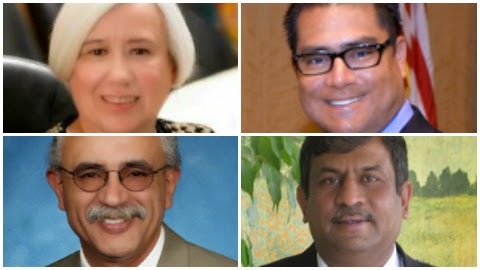 Clockwise from the top: Councilmembers Barbara Halliday, Mark Salinas, Francisco Zermeno and Hayward businessman Rakesh Kumar Christian. THE CANDIDATES All three major candidates are also sitting members of the Hayward City Council hoping to replace three-time Mayor Michael Sweeney, who is retiring this summer. Barbara Halliday is the longest-tenured member of the City Council. In previous races, she has proven to be a candidate who consistently finishes at the top of the pack. In the 2012 council race featuring four open seats, Halliday won the top spot. Most describe Halliday as a steady presence on the council. She consistently supported the Downtown Hayward Loop and has held steadfast on her vote earlier this year imposing a five percent wage cut on city workers…Councilmember Mark Salinas’s run for mayor constitutes one of the most ballsiest political moves in the East Bay. If he does not win this race, he’s out of office after choosing not to run for likely re-election this year on the City Council. Salinas, too, voted for the wage imposition, but does not support the Loop, disliked by many Hayward residents…Just two years ago, Councilmember Francisco Zermeno barely snagged the last open seat on the City Council at the expense of long-time member Olden Henson. Zermeno’s political career has had serious ups and downs, but he’s hoping this year he can parlay his support for Hayward businesses and the growing Latino vote into a win on June 3. He was the first candidate to enter the race a year ago and like his council colleagues, voted for the wage cut imposition. However, unlike Halliday and Salinas, Zermeno has tried to temper his rhetoric toward city workers, but still stands by the vote that raised significant ire from the Service Employees International Union Local 1021…Rakesh Kumar Christian is Hayward businessmen who ran for governor in 2010. He did not win. Incidentally, in addition to running mayor of Hayward, Christian is also running another challenge to Gov. Jerry Brown this June concurrent to this race. MAIN BEEF Curiously, the main issue in this race is not between the candidates, but the group of three who voted for a contract imposition against city workers. Although, SEIU Local 1021 failed to find a union-friendly challenger in this race, they effectively shut off any support from others to Halliday, Salinas and Zermeno. Vote “None of the above” has been the mantra for mayor. But, obviously, one of them will become mayor next week. Hayward residents care about four things: attracting new business downtown, the Loop, crime and schools. The last issue has little relation to what a mayor can accomplish. Salinas opposes the Loop, while the others offer tacit support for the unpopular issue. However, an interesting predicament confronts each candidate. If Hayward is in such bad shape, why hasn’t one of the candidates done something tangible to fix it as a sitting council members? As the candidate with the least experience on the council, Salinas has tried to use this logic to make a case for himself, but it remains to be seen how voters will react to a Hobson’s Choice of three candidates, all with a hand in furthering an unappealing status quo in Hayward. QUOTABLE “Let’s face it, we probably never will in our lifetimes be a very wealthy city like, I don’t know, Piedmont, Palo Alto,” said Halliday during a forum in April. Campaign Finance, cash on hand through May: Zermeno $21,834; Salinas $17,046; Halliday $12,132; Christian, no report filed. 2010 Mayoral Election: Michael Sweeney 97.3%; Write-In 2.7%. PREDICTED ORDER OF FINISH 1. Barbara Halliday 2. Mark Salinas 3. Francisco Zermeno 4. Rakesh Kumar Christian. AFTERMATH The first order of business for whoever becomes mayor is reconciliation. A near majority of the City Council running hard-fought campaigns certainly fosters animosity. Furthermore, the loss of Mayor Sweeney in this area could be impactful. Sweeney was often the guiding hand for goodwill and unity on this council. That’s gone and the new paradigm in Hayward will be tested early. First, the new mayor desperately needs to mend the situation with its public employees. Second, if either Halliday or Zermeno become mayor, there is the question of who is appointed to fill out the remaining two years of their council term? Could it be Salinas? After all, he decided to not seek re-election to council this year for a run at the mayor’s office. It’s unclear how well such a scenario would go over with the public. 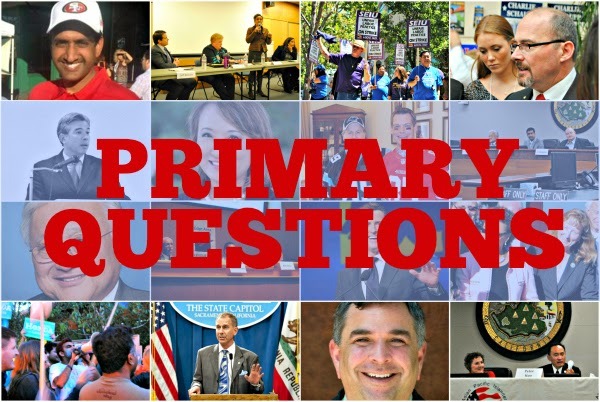 Posted in Barbara Halliday, Downtown Hayward, Francisco Zermeno, Hayward, Hayward Loop, Hayward mayor, June primary, Mark Salinas, Michael Sweeney, primary questions, Rakesh Kumar Christian, SEIU. Bookmark the permalink. Mayor Sweeney's “good will” doesn't guide the Council. Fran David is a puppetmaster and Sweeney is a controlling, ill tempered individual. Halliday has been on the Council far too long & Salinas hasn't done much for Hayward either. He should think about that before finger pinting at his council co-horts. Believe Fran should leave and give the post Sweeney council a chance to make its mark. How to get the 4 votes will be tough given that Mendell and Piexoto were puppets to Sweeney, Jones appears to be an out of touch conservative who cowtows to Anna May, and tensions will exist between those who are running for Mayor. The SEIU will have more influence and the firefighters a bit less. Leadership and getting majority approval will be a real challenge for the new Mayor. There is no question mark about Francisco Zermeno. The man is as clueless as they come. He acts and thinks from uninformed positions without thought, without weighing what he is hearing versus reality. You know, the old “consider the source” theory. It's completely foreign to him. He does whatever seems politically correct, not what is right. We need to choose someone who is less of a schmoe. 11:01, your comments about Zermeno can also be applied to the entire Hayward City Council. They all have no clue. If Hayward is really in such dire financial straits, why spend 60 million on a new library? Basing a Measure on Sales Tax and harping about empty store fronts–WTF? If Measure C passes, somebody better start attracting businesses & shoppers to pay for the 21st Century Learning Center, 85 million dollar Police Station, Stadium, Performing Arts Center or whatever other extravagant crackpot notion meant to waste taxpayers money. Former City Manager Greg Jones wouldn't have resurfaced on City Council if it hadn't have been for Police & Fire Unions. Too bad there wasn't an ethics clause to keep him from running for council. Anna May can't help but make cutesy remarks to Greg on the dais whenever she addresses council during public comments. They both make my skin crawl. He shamelessly plugs Realty World on his City of Hayward xoicemail. The City should fire Fran David. Fran can move to Hayward, get police & fire to endorse her & she can get a seat on council too. A safe harbor for rotten City Managers–raises & lifetime medical for bigtime screw-ups. My wife and I voted for Ms. Halliday, as she seems to be the most conservative of the lot. Mind you, we understand that she is merely the least of the evils. Whole election is scary for the future of Hayward. Zermeno will win. Salinas has done nothing yet says he has, Halliday seems to know what she is doing but I question her thoughts. Salinas is now history. Bill Aragon was history after one term and Zermeno will be history in 2016. We really need some quality Candidates who can effectively represent a growing segment of our diverse community for the long haul. School board members have been the same. All short timers with no apparent commitment to the long haul. I don't think the commitment of the individuals running and serving is in question, I believe Hayward's power brokers and older white voters simply do not support candidates who don't look like them. Perhaps, but many people of color have been elected to HUSD and a few to council. Majority in city are people of color so majority of voters should be the same. Appears that Salinas and Zermeno split some votes. Can't blame whites for that. Oh well, maybe next time. Halliday won the election because she was the most progressive of the candidates running for Mayor. Hope they select the council member to replace Salinas by an election in November. I agree——let the voters decide! Halliday won because of the older residents of Hayward, who either voted by mail or wentto the polls on election day–I'd venture to say a lot of her votes were from white people. The older fols of Hayward like to keep things the way they. That's why they re-elected Peixoto. Hayward needs term limits.Why not eliminate a seat on Council, because of Hayward's precarious finanaciak problems? Dublin has less council memebers than Hayward does. If Barbara is so “progressive” & she wants to make Hayward fiscally stable, she can cost cut council first. Ooh wait, that'll NEVER happen.